The gloves look nice. 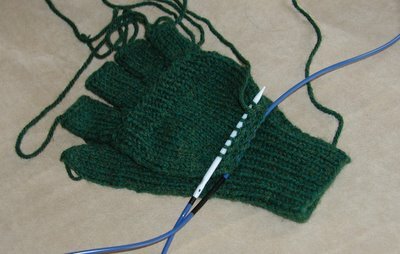 The pattern's probably easier to understand than that Broadstreet Mittens one too. Love the hourglass color. I will have to find me some LB in that shade too. I was on a fancy yarn kick for a while...and now I am back to wanting machine washable stuff because I HATE HAND WASHING! I love that mitt/glove. Those are the best things for winter! And I just now read your hourglass entry! It's finished!!! YAY!! It turned out great, but I'm with you on the sizing. That's just such a huge difference between the two sizes. It still looks great on you. Nice and comfy! The glomit is great. 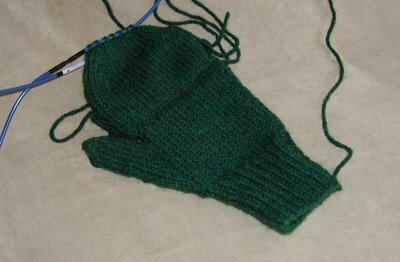 I need to knit myself and Mr. Effer a pair. I think they are so practical. And who cares in CNY what your handwear looks like when it's freezing outside? I've always been curious on how those were knit. Nice work!